If Andrew Romanoff makes it to Congress, he’ll owe a great deal of thanks to Nancy Pelosi and her set of well-heeled left wing donors. He’ll owe it also to the very events he decries on the campaign trail in Colorado, but gladly attends out of the view of Colorado voters. 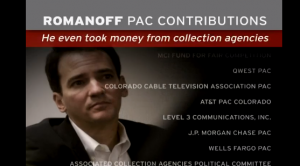 For as long as Colorado Democrats have been claiming Andy Romanoff as their knight-in-shining-armor, we here at the Peak can’t help but feel this man is more apt at playing checkers than chess. Then again, a man who has never won a race outside of the most urban parts of Denver, surely never considered running to the left of a sitting Democratic Senator in a decidedly purple state like Colorado could be politically fatal; he’d never known anything else. Make no mistake about it, for all intents and purposes, this is Romanoff’s last stand. When he loses this race, he’ll have lost two consecutive elections, and 2016 will be eight years from the last time he was in office. He’s only a drinking-problem, some stretch marks, and a bum knee away from entering the washed-up hall of fame.